Are you struggling trying to find a Power Wheels for your child? With so many different options available, we understand how tough it can be. That’s why we’ve created this extensive review after researching what the best options have to offer. All you need to do is have a quick read below to learn more. A buying guide section is also available at the end to provide you with more useful information that will help you be well on your way to finding the perfect Power Wheels toy for your child! This Power Wheels is powered by a 6v battery which enables it to travel up to 2 mph when it’s not on the track. In order to keep kids safe, it travels at 1 mph while on the tracks. There’s a total of 18 feet worth of track for kids to ride on with the vehicle toy. We were impressed with the design of this one and how it makes sound effects and phrases. This is a highly interactive feature which stimulates your child’s audible learning senses. Furthermore, the toy looks just like the Thomas character which your kids may love. As a result, they’re able to play with a lot of creativity. Kids are also able to use it easily due to the push start and stop button. The 18 feet of track that comes with this one provides kids with a unique way to play with their Power Wheel. It makes the riding experience more exciting and encourages creative thinking. 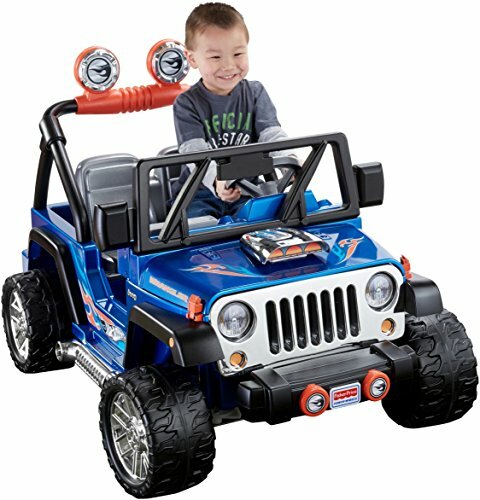 This Hot Wheels Jeep Wrangler is available in a blue color which boys have been loving. It features a 12v battery that enables kids to use it to travel at speeds between 2.5 and 5 mph. There’s also a useful reverse function that can come in handy too. In addition to this, the vehicle toy makes revving and motor sound effects. This works effectively to make the toy feel more realistic to play with, which inspires kids to play with it in more imaginative ways. We also liked how they’ve used fantastic graphics to design the vehicle, as well as chrome wheels and accents. These design features add to the realism of this toy. A storage area is also available at the rear for kids to carry items and drive around. 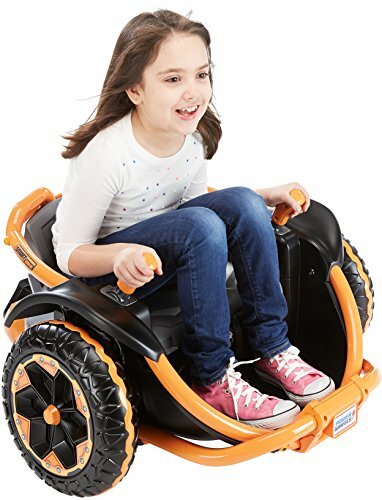 The sound effects and design of this Power Wheel makes it super exciting for kids to drive around in and encourages them to play with a lot of imagination. 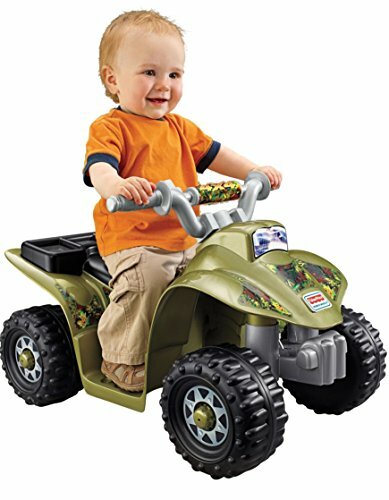 This Lil’ Quad is available in an awesome camo color and has been equipped with a number of fantastic features that make it easier for toddlers to play with. There are footrests available that make the ride comfortable and safe. In addition to this, they’ve implemented a push-start and stop button which makes it super easy for toddlers to use on their own. The toy vehicle is able to travel at a top speed of 2 mph, which is plenty for younger children. Furthermore, we liked how it’s able to go across grass surfaces, as well as concrete. This is because it doesn’t limit kids and encourages exploration, which can be great for their creative side. The footrest design makes this one very comfortable and safe for toddlers. They love having the ability to ride across grass surfaces and explore more too. The Wonder Woman Jeep Wrangler by Power Wheels has been created with a fantastic Wonder Woman-themed design that includes graphics. This inspires kids to explore their pretend play abilities and pretend to be the character. As a result, you can expect their creative thinking skills to be improved. We also liked how it comes with a radio that speaks phrases from the character and makes sounds of real vehicles. These features are super interactive and stimulate your child’s audible learning senses. They also make the vehicle feel more realistic. Kids can even use this one on grass surfaces, as well as concrete to ensure that they have more freedom while playing. Kids have been loving how they can drive around in this one and pretend that they’re Wonder Woman due to the design and phrases. It’s great for encouraging your children to play with more imagination. 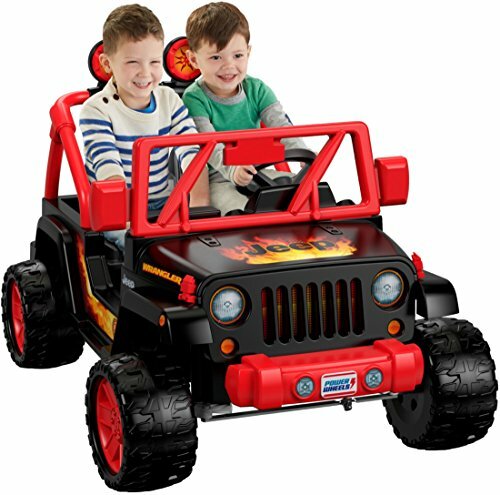 The Tough Talking Jeep Wrangler has been created with some fantastic flame graphics that make it more exciting for kids to play with. We were also impressed with how there’s a microphone that kids can use to talk through and amplify their voice. This is a result of the built-in speaker that’s available. This speaker is also able to play realistic sound effects of a car. In addition to this, they’ve incorporated a radio that can play a range of songs for kids to drive around and listen to. It can travel at speeds between 2.5 and 5 mph and has a handy reverse function. Children have also been making use out of the storage area that’s available at the rear of this one. They have a blast transporting different items and toys around. We were surprised to find how this Power Wheels toy vehicle features a microphone that amplifies your child’s voice via the speaker.s It’s a unique feature that kids absolutely love. Power Wheels’ Dune Racer in red has been constructed with a strong frame that includes high-quality metal materials. Therefore, you can be sure that it will last your child for a while to come. It features bucket seats which have been specifically designed to be comfortable for kids. As a result, they’re able to drive around comfortably during longer play times. We liked how they’ve also implemented metal sidebars as they provide kids with additional support. This one can travel at speeds between 2.5 and 5 mph, which is plenty to ensure that your child is able to have fun, while also being safe. Kids have also been loving how they can use the storage area that’s available under the hood to transport items around. The bucket seats that are available with this toy keep kids comfortable while they play outdoors. Having a storage area under the hood is a lot of fun for transporting different items and playing creatively too. 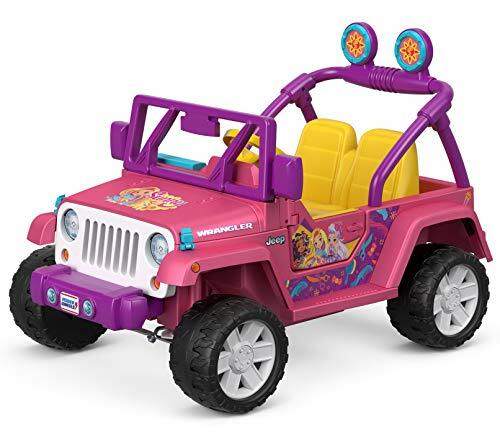 This Nickelodeon Sunny Day Jeep Wrangler has been designed to look like the real thing which involves a spacious storage area and doors that open and close. These realistic features help to make the experience more exciting for kids, which encourages them to play with more imagination. They’ve included a radio that lets children listen to character phrases and sound effects. This feature is stimulating for your child’s audible learning skills. There are also 2 seats available which lets your child and their sibling or friend sit in it at the same time. This is an awesome way to help your child develop their social skills. It can can also travel at a top speed of 5 mph and reverse at a maximum of 2.5 mph. A remote is available that provides parents with total control over the vehicle toy to keep their kids safe at all times. Some find that there are too many screws to assemble! The 2-seat design enables your child and a friend or sibling to play together at the same time which improves their social skills and can encourage them to come up with more creative ways to play. 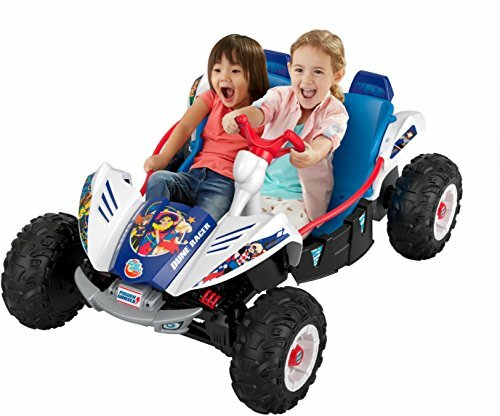 The Power Wheels Wild Thing features dual joysticks which enable kids to control the toy to go forwards and backwards. They have an absolute blast being able to use these controls to perform exciting 360-degree spins. It can travel at a maximum speed of 5 mph which lets kids have a lot of fun, while also keeping them safe. You’ll be glad to find that there are parent-controlled speed settings available too. This lets you put limits on how fast you want the toy to be able to travel. We were also impressed with how there’s traction control available as it lets kids go onto off-road surfaces and still be in complete control. This is even more so the case due to the larger tires that have been fitted. The 360-degree spinning feature that’s available is a unique feature that kids have been loving. They’re also able to use the toy on off-road surfaces due to the excellent traction control. 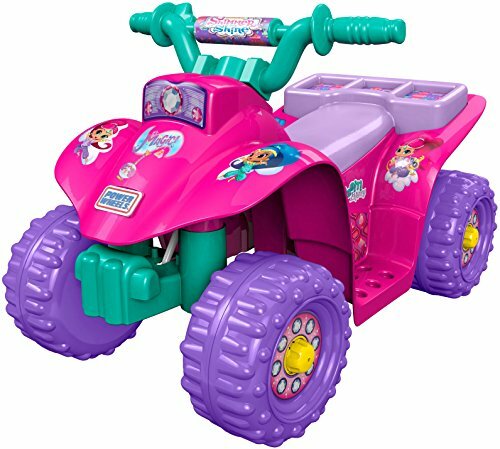 This Power Wheels Nickelodeon Shimmer & Shine Lil’ Quad can travel at a maximum speed of up to 2 mph. Therefore, it’s a great option for younger kids as you can ensure that they’re only able to ride at safe speeds. We liked how there are allocated footrests available as it makes the ride on toy more comfortable to sit in. As a result, kids can play with this one for a long time without any discomfort. The push-start button is super easy for kids to use. Moreover, they’ve been loving the bright colors and graphics that have been used. It inspires them to play with more imagination, which boosts their creative thinking skills. This is an awesome choice for younger kids due to how easy and comfortable it is to play with. The low speeds also ensure your child’s safety too. 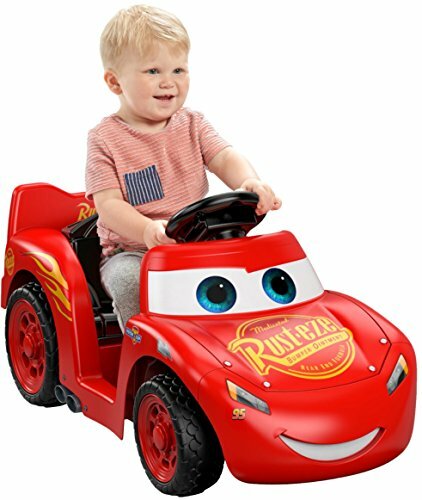 This Lil Lightning McQueen Power Wheels toy features a range of sound features which are a lot of fun for kids to play with. One of them includes race car sounds, which make the car toy feel more realistic and exciting to use. We liked how they’ve implemented an easy-to-use push button to turn the car on and off. This makes it hassle-free for children to use. Moreover, the doors have a wide opening radius which makes it easier for kids to get in and out. It’s powered by a 6v battery that enables the toy to travel at speeds of up to 2 mph. Therefore, it’s an awesome option for younger kids as they’re able to have fun driving around at safer speeds. The sound effects that are available with this one make it more interactive and realistic for kids to play with. This is awesome for encouraging more creative play. 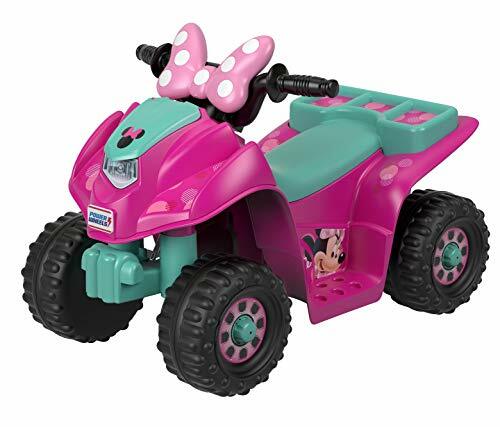 The Power Wheels Lil’ Quad has an amazing Disney Minnie Mouse design which is vibrant and colorful. Therefore, this is a great choice for kids who are fans of the Disney character. It encourages them to play with a lot of imagination. We liked how there’s a push-start button that makes the toy super easy for younger kids to use without any hassle. It has also been designed to be lower to the ground. This makes it a lot easier for kids to get on and off of it. It can travel at a top speed of up to 2 mph, which is perfect for toddlers. It also performs surprisingly well on grass surfaces. Kids love being able to have the freedom to ride this one on both concrete and grass. The exciting design available with this one encourages kids to play with a lot of creativity. With a lower design and push-start button, it’s also very easy for children to use. 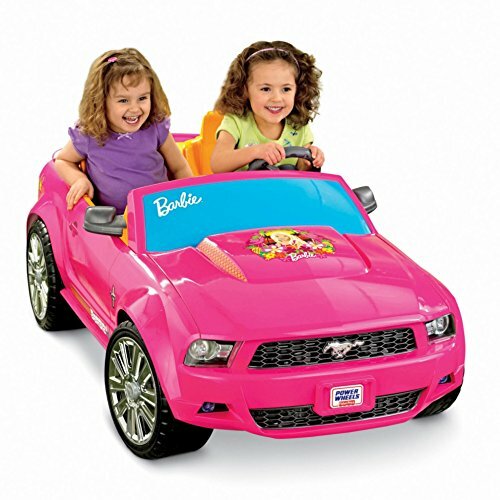 The Ford Mustang Boss Power Wheels car is able to travel at speeds between 2 and 5 mph, which is plenty to ensure that they’re able to have a good time while still being safe. We also liked how they’ve included a reverse feature as it can come in handy when getting out of tricky situations. There’s a radio feature included that lets your child listen to music while driving around. This makes the experience more exciting and stimulates your child’s audible hearing senses. The design of this one is also fantastic. It looks incredibly sleek and sporty, especially since they’re used chrome colors on the wheels. This makes kids feel like they’re driving a real car. Kids have been having a blast driving around in this Mustang car toy due to how they can listen to the radio and pretend that they’re in a real car. It’s excellent for their creative thinking skills. 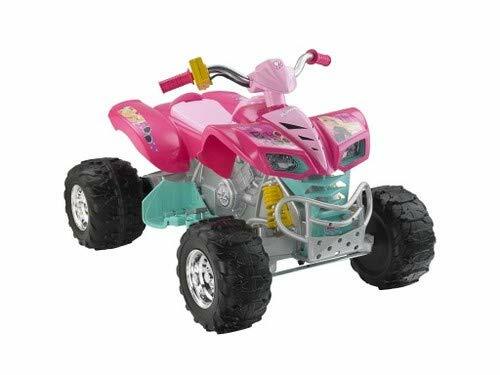 The Power Wheels Barbie Dune Racer has a frame that has been made out of steel materials which work to provide the toy with a lot of strength. As a result, you can feel confident in knowing that it will remain durable for a while. It can travel at speeds between 2.5 and 5 mph, which is enough for kids to have fun with while being safe. A reverse function is also available which can come in handy. We liked how they’ve implemented a Monster Traction system as it allows kids to drive on different surfaces and still have total control. Parents have been liking how a remote control is included too. This provides them with control over the Dune Racer to ensure that they can keep their kids out of danger. 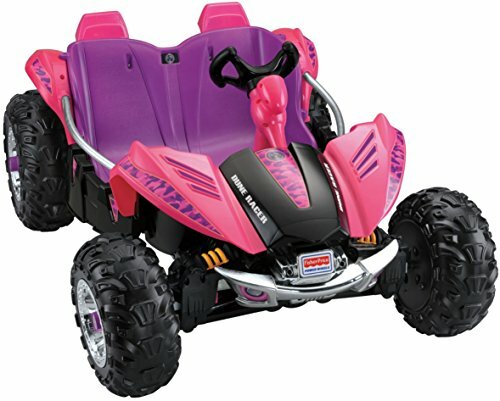 This is an awesome Dune Racer that girls have been loving because of the design. The remote that’s included lets you keep your little one out of harms way. This Jeep Wrangler has been created with a fantastic design that makes it look like the real thing. As a result, kids are provided with a more realistic driving experience which helps them to play with more creativity. There’s a storage space at the rear of the toy car which kids love using. They can use it to put different toys and items inside to transport them around. This is another great feature that inspires them to play with more imagination. It’s able to travel between speeds of 2.5 and 5 mph, which is plenty for kids to have fun with and be safe at the same time. A reverse function is also available and it can come in handy during different situations. The realistic design of this toy makes it fantastic for helping kids to play with more imagination and develop their creative thinking skills. The Lil’ Quad Power Wheel has been made with great footrests that keep your child comfortable while playing. They’ve included a push-start button which is effective at helping toddlers to be able to play with it easier. We also liked how they’ve made the quad to be lower. This makes it a lot easier for kids to get on and off without needing any help. Moreover, there’s a cargo rack available on the back which kids can use to transport toys and items. 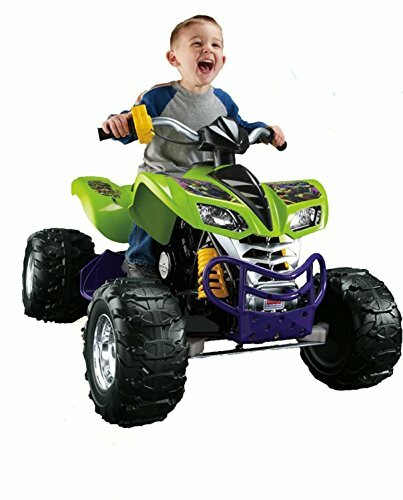 The sporty design of this quad also makes it feel more realistic for kids to play with. As a result, they feel encouraged to play with more creativity. The low design and push-start button makes this one super easy for kids to use on their own. Due to the sporty design, children are also able to play with a lot of creativity. The Batman Lil’ Quad has an excellent design which kids who are fans of Batman have been absolutely loving. Due to the graphics and colors that have been used, children feel like they’re Batman, which encourages them to play with a lot of creativity. It can travel at a maximum speed of 2 mph, which makes it ideal for toddlers who are beginners to these kinds of toys. We also liked how they’ve implemented a push-start button as it makes it a lot easier for kids to use independently. There are footrests that have been purposefully designed to ensure that kids are able to play comfortably for hours on end. This is an awesome Power Wheels toy that enables kids to play with a lot of imagination and use on their own. 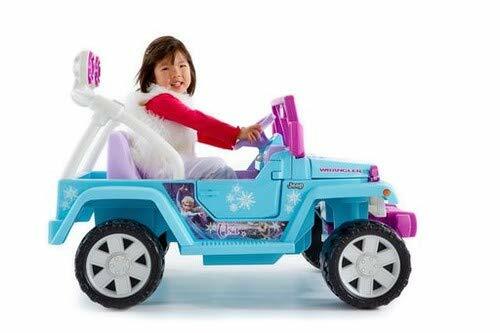 The Disney Frozen Jeep Wrangler has an exciting design which kids who love Frozen have been having a lot of fun with. Due to the colors and graphics that have been used, you can expect your child to play with a lot of imagination. We were also impressed with how there’s a radio that plays songs from the movie. Children have been having a blast with this features as it lets the sing along to their favorite songs while driving around. 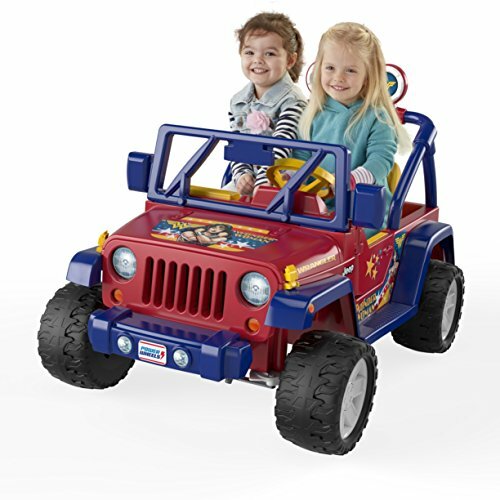 There’s a storage area available at the back of the Jeep toy which lets kids drive around various toys and items. All of the doors can be opened and closed easily to make it more suitable for kids to use. The design and music features that are available with this one make it a lot of fun for kids to play with and use their imagination for hours on end. This Ford Mustang by Power Wheels is another option that has a fantastic Frozen design. There’s also a radio that plays songs from the movie that kids can sing along to. It’s excellent for improving their audible learning skills. It’s able to travel at speeds between 2.5 and 5 mph. We found this to be plenty for younger kids as they’re still able to have a lot of fun while being safe. A reverse function is also available which can be very useful in certain situations. We liked how they’ve implemented seat belts as they work effectively to keep your kids safe. A real cup holder is also included which is great for keeping your child hydrated while they’re playing outdoors on a hot summers day. The music features and design of this one encourage kids to sing along and play with ton of creativity. The Nickelodeon Teenage Mutant Ninja Turtles Kawasaki KFX can travel at speeds between 3 and 6 mph. This is lots of speed to enable children to have a blast, without being at a high risk of danger. A reverse function is also available which can be useful. We liked how they’ve implemented a twist-grip throttle as it provides kids with an easy and fun way to control the speed. 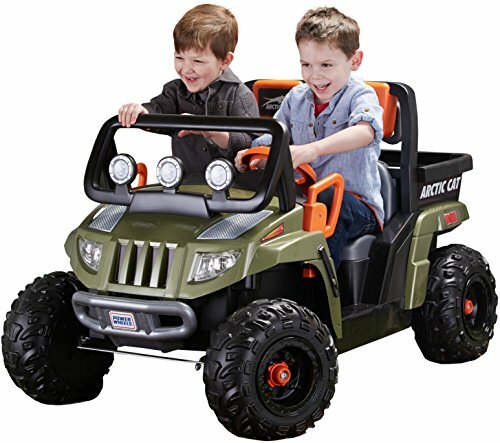 Due to the Monster Traction system that has been incorporated, this Power Wheels toy is able to travel across wet and rough terrain while maintaining control. The Teenage Mutant Ninja Turtle design is colorful and super exciting for kids who are fans of the those characters. It’s a great way to inspire them to play with more creativity. Kids have been loving how they can use the throttle to control the speed of this one. The design is also fun and encourages them to play with more imagination. 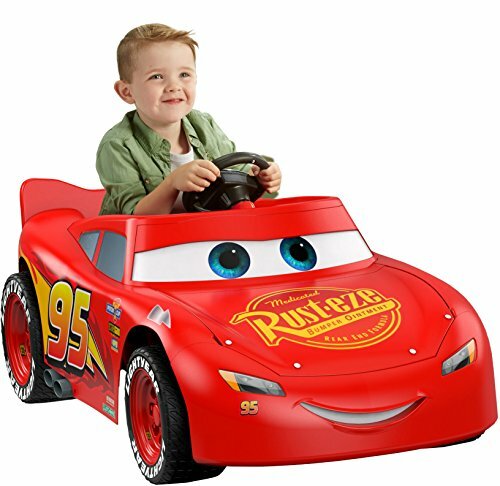 The Power Wheels Disney Cars 3 Lightning McQueen is a great options for kids who love the movies. It comes with a fantastic design that makes it look just like the car from the movies. We were also impressed with how it can make racing sound effects and talk phrases from the movie. The sound effects make it feel more realistic and the phrases make kids feel like they’re in the movie, which is awesome for their creative thinking. Children are able to drive around at speeds of 3.5 mph, which is plenty for them to have fun without being put in danger. The sound effects and phrases from the movie available with this one make it a lot of fun for kids to play with. It also makes the toy feel more realistic, which is excellent for their imagination. 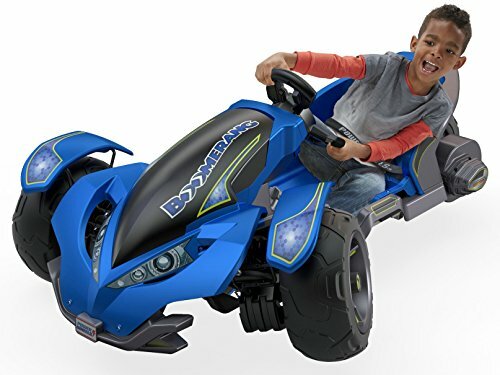 This Power Wheels Boomerang toy comes with an impressive drift mode which lets kids control how they drift the car. It’s a unique feature which is a lot of fun that also manages to remain safe. Children have also been loving how the vehicle tilts to one side when they’re turning. The 4-wheel drive function that’s available provides all of the tires with dynamic traction control across different surfaces. Therefore, you can feel confident in knowing that kids are able to maintain good control. It can be used on hard surfaces, as well as grass, and rougher terrain. Therefore, kids feel encouraged to explore more while driving it. Furthermore, it has a max speed of 5 mph and comes with a handy reverse feature. The drifting feature that’s available with this one is a ton of fun and allows kids to play outdoors in a unique way. 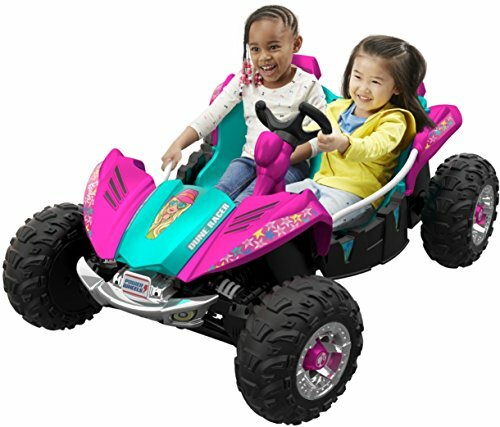 This Barbie Kawasaki KFX Power Wheels toys features an excellent Monster Traction system that works effectively to let kids drive over rougher terrain. Regardless of whether it’s mud, wet grass, or gravel, you can be sure that this one won’t be getting stuck any tie soon. It’s able to travel at speeds between 3 and 6 mph, which is perfect for children to have fun while also remaining safe. A reverse feature is also available which is great for getting out of certain situations. We liked how they’re implemented a twist-grip throttle to let kids control the speed of the vehicle. It’s realistic and exciting to use. Moreover, the Barbie graphics are something that girls have been loving as it inspires them to play with more imagination. The Monster Traction system ensures that your kids won’t be getting stuck in any mud or wet terrain. They also love the Barbie design and twist-grip throttle. The Arctic Cat 1000 has been designed to look just like an arctic cat. Therefore, kids feel inspired to use it and play with more imagination, which is great for their social skills. We also liked how there’s a truck bed with a working tailgate. This is a great realistic feature that encourages kids to play with even more creativity. This Power Wheel is also able to go across grass and rougher terrain without any issues. As a result, kids are able to use it to explore more outdoors. Children can drive it at speeds that are between 2.5 and 5 mph. These speeds are perfect as they enable kids to have fun while driving around without being too fast and dangerous. A reverse feature is also available which is useful to get out of certain situations. Kids have been loving driving around on this one due to the working tailgate and realistic design as it makes it more exciting. As a result, their creative thinking skills are improved. 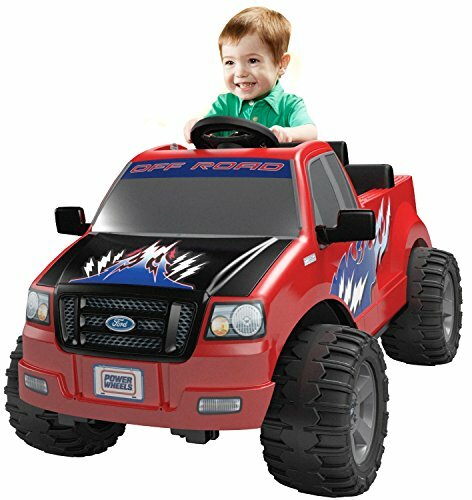 This Power Wheels Ford Lil’ F-150 allows children to drive it at a maximum speed of 3.5 mph. Therefore, it’s a great option for kids who are new to these kinds of toys as the lower speed is still fun, while enabling them to be in control easier. A reverse function is also available which can be handy. Furthermore, the tires have been created with an extra wide design. This provides the toy vehicle with a lot of grip against the ground to help kids steer it better and remain in control. Children have a blast opening up the hood and pretending to fix the toy motor that’s inside. It’s an effective way to boost their creative thinking skills. The DC Super Hero Girls Dune Race features an excellent design that’s full of colors and fantastic graphics. These make the Dune Racer feel more exciting to play with and encourage children to play with more imagination. We liked how the frame has been constructed out of high-quality steel materials. These materials work effectively to ensure that the toy vehicle remains durable for years of play. Furthermore, they’ve implemented metal sidebars that make it easier for kids to get in and out of the vehicle. They’ve included a Monster Traction system that works incredibly well to provide the vehicle with a lot of grip on different surfaces. As a result kids are able to use it on wet and rougher surfaces without any issues. It can also travel at speeds between 2.5 and 5 mph. Kids have been loving how they can drive this Dune Racer on rougher terrain smoothly as a result of the Monster Traction system. 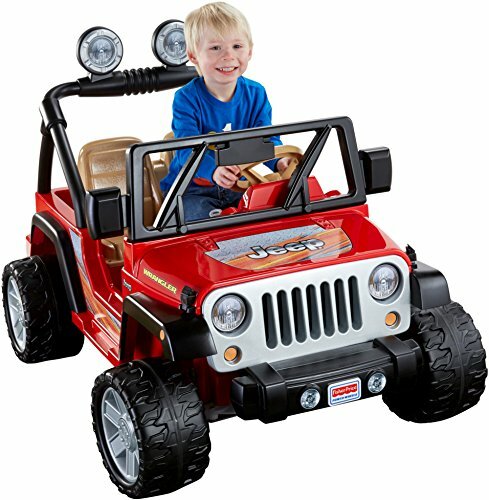 So, that covers our reviews including some of the best power wheels toys that are available for kids. All of the information that you need to narrow down your search and find the one that’s best for you is available above. However, you may still not be feeling 100% certain on which one to select. If so, don’t worry. We’ve put together this buying guide to provide you with additional information. After reading through the review above, you will have seen that there are a number of different kinds of toys available. To ensure that you’re able to clearly distinguish between the different types and pick the right one for your child, take a look below. 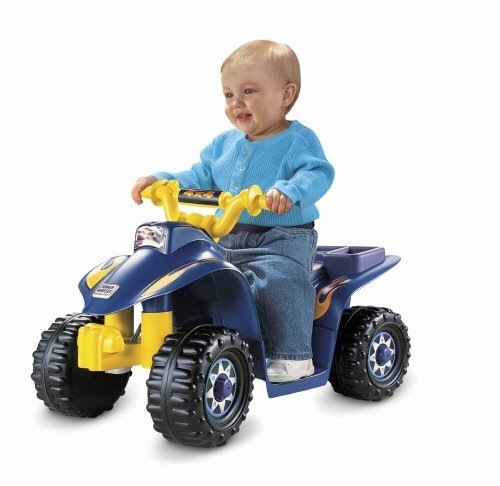 The four wheeler options that we’ve included are awesome for helping kids to ride on rougher terrain with smoothness. This is because they have great suspension systems and high-traction tires. We’ve included a number of great trucks in this review, which are larger in size which means more room for kids. The design and scale of these ones is what makes them a blast for children to play with. The Jeeps options are similar to the 4-wheeler options as they feature awesome suspension systems and high-quality tires that let kids ride around on rougher terrain with smoothness. Children have been absolutely loving how they can ride on toy motorcycles, which is why we’ve reviewed a number of them in this post. Many of them come with additional stabilizer wheels that work to keep your child upright and balanced at all times. Electric dirt bikes are also a ton of fun for kids to play with. There aren’t as many great dirt bike options compared to the motorcycles, but the one that’s in this review has realistic features that make it more exciting for kids. Grave Diggers are a fun type of ride on toy for kids that lets them role play and pretend to dig things up. They’re effective at stimulating your child’s creative thinking skills. Tractors are similar to the grave diggers because they allow kids to pretend to be a farmer. As a result, they love coming up with pretend play scenarios and use their imaginative side. The electric ride on fire trucks that we’ve reviewed in this post come with a number of interactive and realistic features. There are different sound effects, sirens, and even water hoses fitted. They’re an awesome choice for providing kids with something to play with and be creative for hours on end. You will have noticed that there are quite a few fantastic electric cars in this review. These range from sports cars to police cars. The sports cars come with excellent designs that look like the real deal. We also liked how the police cars feature realistic sound and light effects. Both of them are effective at inspiring kids to play with a ton of creativity. 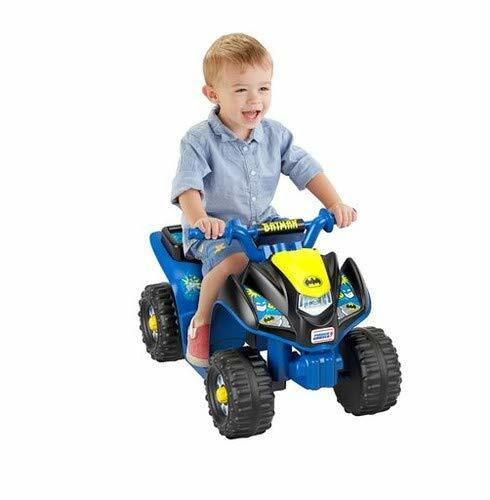 Quad ride on toys are incredibly popular among kids. They’re easy to control and often come with high-quality tires that have plenty of traction. As a result, they’re awesome for taking on off-road surfaces. Gator ride on toys can be fun for kids to play with and pretend that they’re transporting things. They can be exciting toys that let kids play with a lot of imagination. Dune racer buggies can be a lot of fun for kids to drive around on surfaces that are off-road. The suspension, tires, and handling are all created specifically for rougher terrain which can be exciting. When it comes to finding a the best Power Wheel for girls, we recommend going with something that has bright colors or a Disney themed one like Frozen with girly colors. Parents have been finding that their little girls have the most fun playing with the ones that have a pink or purple color. As far as boys are concerned, they tend to love the ones that have a theme. These include the fire engine and police cars. In addition to this, they have a blast driving the sports cars, motorcycles, and trucks as well! While reading through the different options mentioned in this review, you will have seen that many of the Power Wheels feature a parental remote control. This provides you with complete control over the toy vehicle to help keep your child from losing control and wrecking. Of course, you have to be there with the remote to use this safety feature. The Power Wheel toys that we’ve reviewed in this post all have various charging and playing times. Therefore, you’ll want to get a good idea of how long it takes to fully charge because many of them can take longer than 10 hours. So, you’ll need to do a little planning ahead if you know that your child may want to play with it tomorrow or any time sooner. 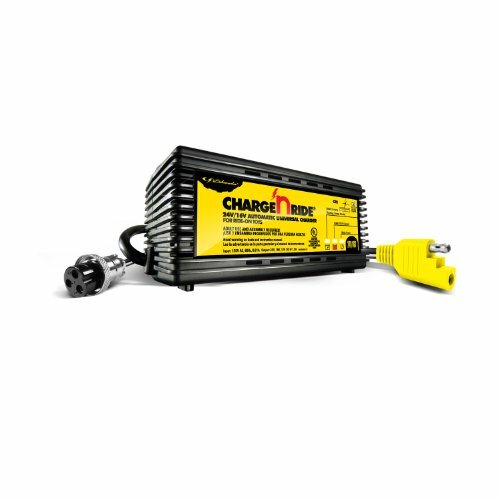 One of the issues that some people come across with these Power Wheels is that the battery diminished in power over time. This is especially the case if your kids are using it on an almost daily basis. 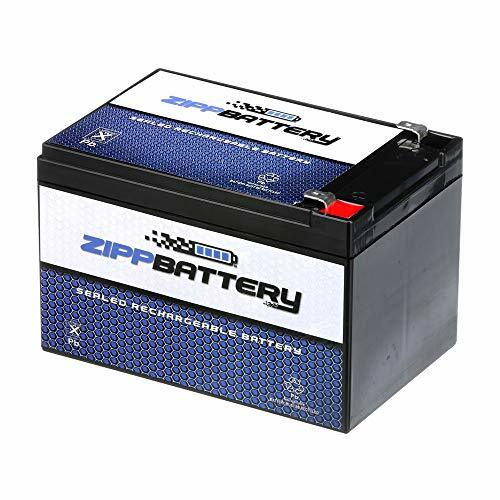 Therefore, it may be a good idea to keep spare batteries on hand. Sometimes, these ride on toys begin to slowly lose power, which is a major sign the battery needs replacing before it completely dies. So, that wraps up our review on what the top Power Wheel have to offer. Be sure to read through all of the main features, pros, cons, age recommendation, and what makes each one stand out. If you still weren’t feeling confident on the one that you think your child would enjoy the most, you can find some additional information in the buying guide. Hopefully, everything you need to go ahead and make a final decision can be found, right here!